With the first round of GOP primary debates right around the corner, at least a few names are sure to be missed. From former HP CEO Carly Fiorina to Ohio Gov. John Kasich, and down the list to New York Gov. George Pataki and former Texas Gov. Rick Perry, a slew of big names will be absent when the stage opens on Aug. 6. The reason? One bigwig, billionaire mogul is vying for the attention of the masses (and a load of screen-time). 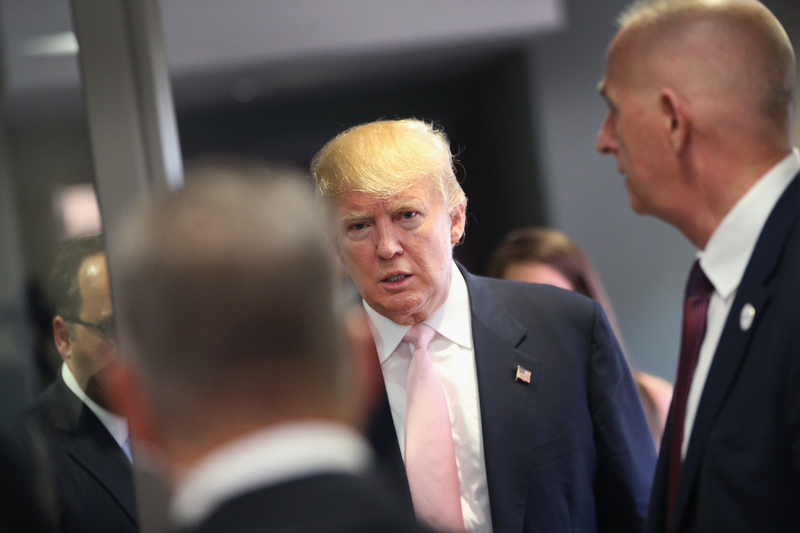 Donald Trump's presence hurts the GOP — more than that, it practically stalemates it. Trump has basically shown he is unfit for the presidency over the past few weeks for more than a few reasons, including his penchant for outwardly racist diatribes against Mexican immigrants and his horrifically unyielding insistence that prisoners of war simply aren't heroes. "I like people who weren't captured," Trump stated brazenly to a conservative gathering in Ames, Iowa, earlier this month. With the GOP field of presidential hopefuls growing larger by the month, debate organizers have been forced to make a choice on where to cut the line. In past years, that number has been limited to eight. The 2012 debates played host to nine separate GOP candidates. This time around, that cap is 10. Not everyone is happy with that number. "In your heart of hearts, you want to see me debate Hillary Clinton," joked GOP candidate Carly Fiorina to an audience in Ames, Iowa, on Thursday last week. Fiorina, who trails her fellow Republican candidates with just over 1 percent of prospective voters in most polls, will almost certainly be missing from the cluster of Republicans set to take the stage at the Fox News-hosted event next week. "I would of course love to be on the debate stage," added Fiorina. "But we're going to keep going with or without it." At the bottom of the list with Fiorina is Gov. Perry, who let loose a barrage of attacks against Trump in a recent meeting with supporters at Washington D.C.'s The Willard hotel. "[He's] a cancer on conservatism," said Perry on Wednesday last week, calling Trump's divisiveness the potential "demise" of the GOP as a whole. "He offers a barking carnival act that can be best described as Trumpism: a toxic mix of demagoguery, mean-spiritedness and nonsense that will lead the Republican Party to perdition if pursued." Perry, who has called out Trump's offensive comments before, was onto Trump's game. Unfortunately, that did nothing to garner a possible invitation to the debates — and that's where Perry was absolutely, 100 percent right: Trump's comical presence in the GOP primaries does little to bolster Republicans and conservative candidates, and does everything to kill their shot at the presidency. "If you're not on the stage you're irrelevant, you don't matter," explained Republican pollster Frank Luntz in a comment to AP reporters last week. "Unless you have some serious ad dollars ... it's a concrete ceiling." That means that hopefuls with actual political credentials to their name won't get the chance to shout their stances on a broader stage, in front of millions of Americans come next week. It means that they'll likely be brushed to the back of the line and slowly discredited as uninteresting as the next few months wear on. In the meantime, candidates like Trump, with all his bravado and fanfaronade (but very little political know-how), will be soaking up the spotlight. Worse still for candidates at the bottom of the ladder, like Louisiana Gov. Bobby Jindal (with an average of 1.3 percent of the vote, according to Real Clear Politics) and South Carolina Sen. Lindsey Graham (with an average of 0.2 percent), Trump's present, sensationalized standing doesn't guarantee him anything in the long run — which means he's taking up valuable space for nothing. What people want is an accurate prediction of what’s going to happen next year. Polls are not designed to do that. What they give you is a snapshot of where things stand right now. You can use that to predict what’s going to happen a year from now only if you assume that nothing is going to change. Trump's numbers might put him at the top of the list at the moment; a Public Policy Poll from July 22 clocked him in at around 19 percent of the vote. But his lead over serious competitors like Jindal and Florida Sen. Marco Rubio force his current status into question. With over a year to go in the long chase to the White House, Trump's wave of popularity, coupled with his proclivity to spout whatever nonsense happens to be churning through his head at the moment, will more than certainly be his own demise. Leftover, of course, will be a host of GOP candidates that no one knows anything about — and if Trump has his way for too long, they'll be lucky to have even that much.